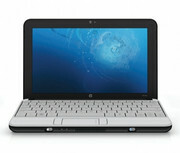 HP's Mini 110 netbook is essentially a redesigned lower cost version of their Mini 1000 series netbook. It features a less impressive external shell and an inset screen but keeps the very well designed keyboard even if the trackpad buttons are in a bad location. The big feature is the built-in wireless networking for use with GSM or CDMA cellular networks. While the system does have a 6-cell battery, battery life isn't as good as the competition. At $450, it is kind of expensive but useful for those needing connectivity just about anywhere. HP's Mini 110c proves to be every bit the modern netbook. The Compaq Mini 110c-1010EA netbook provides the great portability, usability and functionality that we've come to expect from HP devices over the years – and all at a very competitive price. We really like the Compaq Mini 110c. Once again, HP has produced a great netbook which exceeds expectations, and the style, portability and value on offer are extremely difficult to ignore. 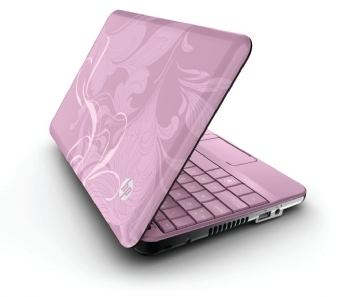 The HP Mini 110 (NB-1006TU_09): a 10.1in netbook that has a swirly patterned lid for its LED screen and an Intel Atom N280 CPU. It's available with either a spinning hard drive or a solid-state drive, and you have the option of purchasing either a Windows XP or Linux model. With a retail price of around £280, the HP mini 110 (NB-1006TU_09) is worth considering if you're after a very portable and relatively easy to use netbook; it looks good, too. You can also save some money by opting for the Linux version, which costs considerably less, but has a 16GB solid-state drive instead of a 160GB hard drive. It's hard to see how netbooks could get much cheaper, but each new generation drives the price floor down, offering better parts for less. The HP Mini 110 (1030US) is no exception, incorporating many elements we loved about the Mini 1000 with a few minor improvements and a significantly lower price tag. The Atom processor is the same, but the 60GB, 4,200-rpm spinning drive we called sluggish on our first look has been revved up. Add onto that an improved feature set that now includes an Ethernet port, among other updates, and you have a solid deal. Though I still have a few complaints, including the obnoxious mouse buttons, the Mini 110 is a better package overall. The HP Mini 110 (1030US) has sweetened the deal with a faster, larger hard drive and a spruced-up feature set. As the slim, snazzy HP Mini 1000 is one of our favourite netbooks, we were excited to hear of a less expensive sequel. While the new Mini 110, which will be available in August for around £280, doesn't stray far from the Mini 1000 mould, there are some subtle changes that are not always for the best.The HP Mini 110 may be easier on the wallet than the Mini 1000, but some design compromises have been made to achieve the lower price tag. Despite that fact, however, it's still a respectable netbook. As the slim, snazzy HP Mini 1000 is one of our favorite Netbooks, and we were excited to hear of a less expensive sequel. While the new $329 Mini 110 doesn't stray far from the Mini 1000 mold, there are some subtle changes that are not always for the best. While the new, less expensive, HP Mini 110 doesn't stray far from the Mini 1000 mold, there are some subtle changes--not always for the best. Judging from the new HP Mini 110, you would think HP has been in the netbook business for years now. Slotting below the company’s popular Mini 1000 and Mini 2140, the Mini 110 keeps those models' 10.1-inch screen and excellent-for-a-netbook keyboard while managing to come in at a lower price. 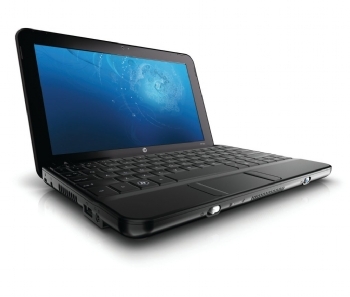 The budget-friendly HP Mini 110 delivers an excellent keyboard and good connectivity in an attractive netbook. The wireless broadband option is a plus. This fashionable, lightweight netbook improves upon its predecessor with increased speed and more ports. Assuming the 6-cell battery on the Mini 110 gets close to the 6-hour runtime claim, the Mini 110 will be one of the better netbook bargains at $369. We’re still not fans of the vertical touchpad buttons, but HP has made several welcome improvements while still delivering one of the best netbook keyboards around. It's up to you to decide if the Mini 110's slightly heavier and bulkier design--and less striking display--is worth having a VGA port, an extra USB port, and a cooler-running system. 72.13%: Diese Bewertung ist schlecht. Die meisten Notebooks werden besser beurteilt. Als Kaufempfehlung darf man das nicht sehen. Auch wenn Verbalbewertungen in diesem Bereich gar nicht so schlecht klingen ("genügend" oder "befriedigend"), meist sind es Euphemismen, die eine Klassifikation als unterdurchschnittliches Notebook verschleiern.